1. Abel Danger (AD) claims that Serco is operating a kill list through its 8(a) company servers and offers shareholders keys to an assassination network where a targeted victim’s death is synchronized with mass-casualty events in Zulu time. 3. AD claims that Serco’s MOD client authorized Hillary Clinton’s aides to use a patented strobe (flicker vertigo) device through the Federal Bridge Certification Authority servers to disable the driver of Princess Diana’s Mercedes and trigger the series of synchronized events which preceded her alleged assassination in Paris on August 31, 1997. 4. United States Marine Field McConnell has briefed Donald Trump on how Hillary Clinton and her fellow feminists have been using the Serco kill list, Adjusters’ International banks and the Federal Bridge to assassinate their enemies, including feminine icons such as Lady Diana, Princess of Wales. As flowers were laid at the Alma ­tunnel in Paris and outside Kensington Palace in London yesterday in memory of the Princess, Mr Power insisted he was not trying to cash in on the tragedy, saying he was seeking “justice for ­Diana”. In his preface for the book, he states: “Diana was murdered by MI6 with military aid’” but does not produce overwhelming ­evidence to support his theory or name the assassins. I offered my evidence but maybe they don’t want to know Alan Power Lawyer Michael Mansfield, QC, said the Milosevic assassination suggestion entailed the use of “the Increment, a small cell of SAS and SBS specially selected and trained to carry out operations for MI5 and MI6”. Retired soldier Rory Allen said her condemnation of a host of lethal armaments had upset certain “figures”. Shortly before she died, Diana visited Bosnia to highlight the death and injury caused by landmines there. South Africa-based military consultant Mr Allen claims she was also planning to expand her campaign to the Middle East by joining him in a mine clearance exercise. She had offered to support his Operation Khamsin project to clear mines at El Alamein in Egypt’s western desert. “She was going to make a big speech in Egypt and speak in other countries,” he claimed. “She had been calling for an international ban on the production and deployment of these items, which had been produced in a number of countries, including the UK, and used in the Kosovo and Serbian conflicts.” At the inquest into her and Dodi’s deaths, coroner Mr Justice Scott Baker told jurors Diana’s friend Simone Simmons said the Princess was preparing a report that she was going to call “Profiting Out Of Misery”. It was said she was going to name names and show that the British Government and public figures were profiting from the proliferation of landmines. Top of the list of “culprits” was allegedly going to be the SIS. 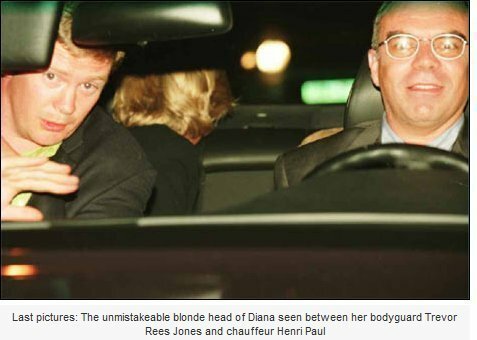 In 2008 the jury returned verdicts that the Princess and Dodi had been unlawfully killed and blamed the driving of chauffeur Henri Paul, who had been drinking, and the driving of “following vehicles”. Witness Francois Levistre said a white flash of light was directed at the couple’s Mercedes, causing the crash. Mr Levistre said he stopped near the tunnel exit and claimed he saw a motorcycle passenger get off, approach the car, look inside and make a hand gesture to the bike’s driver before they sped away. Those two and drivers of other vehicles have never been traced. Here we suggest what we think is most likely scenario of events that led to the crash and take a closer look at what happened in the previous 24 hours: The inconsistencies start the day before the couples death. On their arrival in Paris from Sardinia on 30th August they drove into Paris in a Mercedes driven by a Ritz chauffeur, Philippe Journot. The Al Fayed family later claimed that the car was harassed by photographers on bikes and “a mysterious dark car” which tried to “cut in front and slow them down”. (Independent on Sunday, 7th September 1997). On the same day, Diana and Dodi Fayed also visited the former house of the Nazi sympathiser, the Duke of Windsor where Diana was given a “guided tour of the house and garden” by Dodi Fayed. Mohammed Al Fayed owned the house, and was at the time auctioning some of contents and property of the disgraced Duke and his wife Wallis Simpson. At one point during the evening, Dodi Fayed slipped out of the hotel to collect a £130,000 ring from a jeweller’s which Diana had chosen from it’s sister shop in Monte Carlo. Later, Fayed spoke to one of his cousins, a Saudi citizen, Hussein Yassin. He said Fayed was “happy and elated” and he told Yassin: “We are very serious . . . we are going to get married”. (Independent on Sunday, 7th September 1997). Had l heard what the Lebanese were saying about Diana’s death? They had convinced themselves . . . that it was a plot. The British establishment could not stomach the idea that Diana – in love with an Egyptian Muslim – might herself convert to Islam, So they got rid of her . . . (Independent on Sunday, 12th October 1997). After a meal, the couple decided to make their way to Dodi’s private apartment at Rue Arsene-Houssaye. 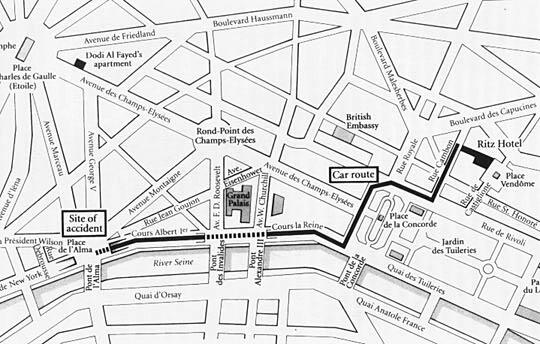 However, the Mercedes is prevented from proceeding along its preferred route (witnessed by Thierry H) – a car that blocks the way along the Avenue de Champ Elysees – thus forcing the Mercedes onto the route that leads to the tunnel at the Point d’Alma. None of the two cars or motorbike chasing the Mercedes at this point contain any paparazzi – they all appear in the first couple of minutes after the crash. As the Mercedes approaches the tunnel it is being chased by two vehicles and one motorbike – it’s possible that one of the vehicles (a white Fiat Uno) rams the Mercedes just before the crash “causing it to spin out of control” (The Guardian, November 13th, 1997). As the Mercedes gets nearer the tunnel, a motorbike prevents one car (driven by Brenda Wells) from taking the approach road that leads to the tunnel. It’s possible that a remote-controlled device was used – causing an explosion (reported by CNN) which was heard by witnesses – that disabled the driving controls and electronics of the Mercedes. A strobe light was also used to disable the driver on the final seconds before it entered the tunnel – which some witnesses claim was completely dark as the lights had been turned off minutes earlier. After hearing an explosion and then a bang, witnesses ran to the scene – only to be told to “back off” by an unknown person to runs towards them out of the tunnel from the direction of the crashed car. A second person, whose identity is also unknown, was seen in the Mercedes removing the drivers head off the car horn. Witnesses also report that a helicopter was seen above just before the crash – was it monitoring events on the ground ? As the electricity has been cut in the tunnel, the traffic cameras don’t work, thus ensuring there is no video evidence of the Mercedes final approach to the tunnel, or what vehicles can be seen leaving it. One witness, Gary Hunter saw two vehicles race out of the tunnel, others saw a motorbike. The person who takes Paul’s head off the car horn injects him with a syringe containing a cocktail of alcohol and other drugs. Thus, the media settle with this as the “official” version of the car crash: the drunk driver was the cause of the crash that killed Princess Diana. After three contradictory autopsies, Paul is buried on the advice of his lawyers, and not cremated, as they advise his body may have to be exhumed again. If MI6 were involved, then they certainly appear to have the means kill Princess Diana by faking a car crash. You can read here Tomlinson claims that MI6 may be involved in the death of Princess Diana in his Statement made on 12th May 1999 to the French inquiry into the crash. You can also read the details of the Attempt by MI6 to assassinate Milosevic in 1992. If it’s true that MI6 planned to kill Milosevic in such a way, then it proves they had the means and capabilities to organise the crash that killed Princess Diana. There have also been a number of suspicious deaths caused by car crashes of people working in the defence industry in Britain during the 1980’s, which we have summarised from Tony Collin’s book Open Verdict. The jury was told that Diana’s friend Simone Simmons had listened in on a telephone conversation at the Princess’s invitation in February 1997 and heard the then Armed Forces Minister warn her “accidents can happen”. “Adjusters International, formed in 1985, is a public adjusting and disaster recovery company, who assists clients with financial recovery from insurance claims and U.S. Federal Emergency Management Agency (FEMA) grants. The company’s headquarters is in Utica, New York. It has more than 40 regional offices across the United States. The boss of government outsourcing group Serco quit to allow a new boss to be appointed from outside the troubled company. Serco is scrambling to restore its reputation following a series of debacles ranging from failing to provide enough doctors in Cornwall to charging the government for electronic tags on dead prisoners. We practice Diversity Recruitment and Staffing for IT positions Base One was founded in 1994 by a women engineer who had made a career in technology research for many years. Base One has been very successful in focusing on diversity recruiting and staffing for IT projects. It has been our experience that the greater the diversity mix, the more creative the solution. As in any field the more diverse the viewpoint the more thorough your analysis. Our engineers can think out of the box. Base One’s staff of engineers are a diverse group of professionals. This diverse network of engineers helps us to branch out to other engineers and creates an even larger network of resources for us to work with. The greater the diversity the more complete & thorough the analysis. The broader the spectrum of points of view the broader the scope of the analysis. We feel that a diverse team gives us a greater advantage in creating cutting edge solutions. To that end we will continue to nurture these relationships to further extend our talent pool. The more diverse the viewpoint, the more thorough the analysis. The more diverse our team, the more our engineers can think out of the box.